When Easter arrives each year, it’s obviously the perfect excuse to stuff our faces full of chocolate. I usually toy with the idea of making Easter themed treats for a while, but baking simple cupcakes doesn’t appeal to me. 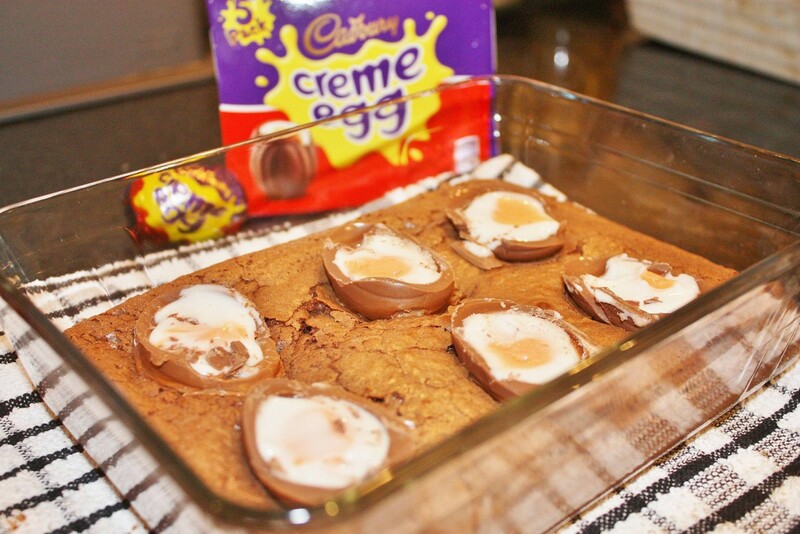 Instead, I’ve thrown together a quick recipe to create these delicious Creme Egg brownies. Boy, do they please! As well as easy to make, they taste ridiculously good, how would you eat yours? I started with preheating my oven to 180 gas mark 4 so no time was wasted. In a pyrex bowl mix together the butter and dark chocolate over a pan of hot water, this will take a few minutes. Once melted, set aside to cool or put bowl into the fridge for 10 minutes. While this cools, mix together the eggs and sugar. The mixture should be thick in texture and pale in colour. Once the chocolate mixture has cooled, add eggs and sugar mix to the bowl making sure to stir in well. Finally add the flour and cocoa powder and fold everything together slowly. Pour into a baking tray or pyrex dish and pop into the oven for 20 minutes. Before prepping ingredients, it’s a good idea to pop the creme eggs you will use for toppings into the fridge to harden for a while. When the mixture starts cooking in the oven, remove the cold creme eggs from the fridge and carefully cut them in half using a sharp knife and set aside on a plate. After 15 minutes, remove brownie mixture from the oven, it should be crisp on top but still gooey in the middle. This is the ideal time to place the eggs face up into the mixture, pressing down firmly. Depending on size of baking tray, you may wish to add more eggs. Put back into the oven for another 15 minutes to cook through. Remove the brownies from the oven and make sure they’re cooked by placing a knife in the middle. If it comes out dry it is done! Leave to cool on the side for an hour before attempting to remove from tray as it may fall apart. The brownies have disappeared fast in our house and they are amazing to eat warmed up with a scoop of ice cream! They are so tasty, rich and gooey – perfect for snuggling on the sofa with a cup of tea. I really enjoyed making this small batch and I even had the thumbs up from Josh which is always a positive sign! What do you think of my creme egg brownies, will you be making any of these?